Nick Barker has always been an intriguing and integral part of the Australian alternative music scene. He started out in the mid '80s with Melbourne band The Wreckery, then branched out to form his own group, Nick Barker and The Reptiles. He reached a level of mainstream fame with their cover of Steve Harley's 1975 hit song, "Make me Smile (Come up and see me)". Since then, he's had a successful solo career, collaborated with other musicians, and has even become involved in acting and score-writing. As a teenager in the mid to late '80s, I saw every Brisbane gig that Nick played in these bands and, among his fans, there was an evident sense of loyalty and devotion to this singer-songwriter. Not only does Nick have an evocative story-telling style within his lyric writing, but he's an extremely likeable person. I always found his onstage persona to be witty, jovial, and very down to earth. So it pleases me to no end to be reviewing his latest album, Black Water Blues. While his style has morphed from swamp punk to rock to blues over the years, the fundamental elements which make Nick's music stand out are still here: reading his lyrics, it's like being slapped in the face by a poet, simultaneously melancholic and confrontational. The lines on your face hide the mind of a child. The care taken with the packaging of this album also reflects the attitude with which Nick approaches all aspects of his music: it's deeply original, creative, all done with integrity. The atmospheric artwork by Emma DeClario sets the mood to listen to this gem of an album. There's a sense of home in this album's sound. By that, I mean it's intimate and real. The music takes you on a journey into Nick's life and mind and you leave the experience feeling touched by the subtleties and mood created. Although the album, genre-wise, borders on country / blues - and I'm not normally a country music fan - the authenticity of his approach creates a sound that is wholly his own. With Nick Barker, there is no 'front', no walls erected. There are few other musicians who can entice me to listen to country-sounding music - Johnny Cash is one - but I believe that when a musician sings the blues, and really considers his or her lyrical content when doing so, it creates a ripple effect of raw emotion in the listener. Combine this with infectious, toe-tapping guitar riffs which promise great live renditions and this album is a winner. The song Black Water paints a portrait of everyday life and creates vibrant mirages in the mind of the listener: The black crud from the coffee machine is dripping through me slowly. Where I Wanna Be adopts its bluesy roots in a more traditional form, and features the sublime vocals of Felicity Urquhart. This song is so incredibly beautiful, I literally get shivers listening to it. The use of the dobro brings a traditional feeling to Sugaree. Good Days Bad Days takes toe-tapping to a new level with banjo accompaniment; how can you say no to a banjo? 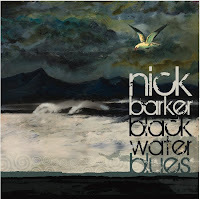 Black Water Blues is a moving album experience and creates a warmth of feeling. It brings to mind images of sitting on the verandah with friends, discussing those shared experiences that make you laugh, think, weep and remember. Nick Barker is setting out on an Australian tour during October through to December. For details and more information about Nick and his music, visit his MySpace at http://www.myspace.com/nickbarkermusic.